The Canon EOS 5DS nabbed one of our top “Best Overall” slots thanks to its superior high resolution offering – in fact, it offers the highest resolution of any full-frame camera. It’s that fantastic resolution that makes the 5DS so highly regarded in the lineup of DSLR cameras. 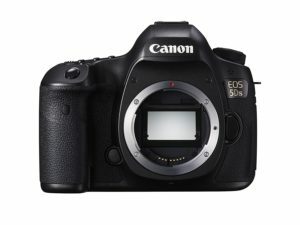 The Canon EOS 5DS comes in two versions: The 5DS and the 5DS R. The only difference between the two models is the R version includes an optical self-canceling filter. The format, function, and design of the 5DS clearly illustrate the intended photographers for this model. This camera is best for landscape, architecture, and portrait shooting – shoots where resolution matters, and speed and ISO range matter less. The overall quality of the images the 5DS produces does not disappoint. Images are rich, sharp, and show detail beautifully. This makes the 5DS an excellent camera for enlargements, gorgeous portraits, and professional prints. The Canon EOS 5DS is truly a camera for experts. The emphasis is on technique and gear, but the outcome, of course, is stunning. Many creative users and designers, as well as landscape photographers and more, will find the resolution and other perks of this model are well worth the larger file sizes. Still, it lacks the ability to shoot 4K video, which some users have pointed out as being a missed opportunity, especially for users like wedding photographers. Despite that miss, the overall feel of the 5DS is that it is all business. In addition to functionality and the focus on pixels, the added technology of the shutter delay feature helps to practically eliminate all chances of vibration – critical for shots like long exposure or other instances when even minute details matter. Many users are comparing the 5DS to the 5D Mark III, but whichever model you’re comparing it to, you’ll find that Canon definitely focused on updating the technology and features of this, most likely in order to take on medium-format cameras. The 5DS is more cost effective than many of those pricier models, and it’s not just the ridiculous pixels that make it a competitive offering. One of the coolest new features of the 5DS is the new metering system. Shooting in bright daylight proves to be no problem for this camera. Canon also added time-lapse to the EOS 5DS, making it simple to use in camera. Users will also love the silent shutter. These are just a few of the new and advanced features offered on the 5DS. The Canon EOS 5DS isn’t for everyone, but for those who fall into the niche, you’ll be blown away by the resolution. The price is nice for a medium-format camera, especially (yes, we’re going to say it again) given the high resolution that no other camera can match.